The Golf Tavern opposite Bruntsfield Links has a planning application in for a ‘golf starter hut’ on the Links. There is no explanation as to why there should be the construction of a second starter’s hut (There is currently a lovely Victorian one). There do seem to be past edicts (e.g. 1991 Confirmation Act see sectionPART VI – about no buildings to be built on the Meadows other than those listed in the Act). This is to stop the building of permanent structures on the Meadows and Bruntsfield Links, a Premier Park in the city and also has Millennium Park status*. The formation of a crossing from Bruntsfield Links to the door of the Golf Tavern seems to be another commercialisation of this public space. The main reason for the objection is the reported use for these changes; i.e. the expansion of the Golf Tavern’s business onto Bruntsfield Links with the use of tables and chairs. Tollcross Community Council object to this type of privatisation of public space and particularly so on the Meadows and Bruntsfield Links which historically and by edict have remained a publicly useable amenity. On these ground alone we have written a formal objection from the Community Council and hope that Friends of the Meadows and Bruntsfield Links – the Parks friends group will formally object to the planning application too. 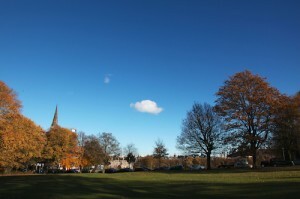 The 1991 Confirmation Act has this year been brought to bear on a Broadband box planned for Bruntsfield Links, very close to the location of the above application. The broadband box application was withdrawn before it even got in front of planners because of the ‘hyper local’ outcry. So we hope the Council will see sense again. We understand that the 1991 Confirmation Act specifies that only housings for the supply of electricity or gas can be erected on the Meadows and Bruntsfield Links—it does not cover all utilities including broadband. The legal status will be further researched by our committee with the assistance of local councillors and officials. The area of Bruntsfield Links Park has been the subject of an improvement scheme which was approved by the Council Parks department and we now have possible funding to carry this out. The proposed broadband box would seriously compromise this proposal. Tree roots in the area are very shallow and could be damaged. This proposal would seriously affect the view and access leading into the public open space. It would become an unwanted intrusion into what should remain (become a semi-hard landscaped area to avoid pedestrian tracking damage) as an attractive green/hard landscaped area viewed from multiple access points as well as from surrounding flats. To be fair the Golf Tavern already has tables and chairs outside the premises, and during the summer is well used with a lot of noise. On the other side of the road is the peace of the Meadows and Bruntsfield Links and if after a round of Golf at the Short Hole Golf Club you require a libation; after all its only a short walk to the Golf Tavern should you wish to attend. *In December 2000, The Meadows was designated as a Millennium Park. The move by the City of Edinburgh Council followed an approach from the National Playing Fields Association (Scottish Branch), now known as Fields in Trust (FIT) which will ensure that the park will be protected in perpetuity as community open space. The Council will maintain them in good condition and report to FIT, the level of use by the general public. A commemorative plaque is situated on a presentation stone at the Middle Meadow Walk. F*****G unbelievable!!! Yet more privatisation of our beloved green spaces and parks! RESIST OR LOSE OUR PARKS!